I titled this post Berries and Fairies, but I could have just as easily called it June in Portland. There is something about Portland that bestows a green thumb upon all who live here. Seriously. I kill plants. I kill all plants, always. But not here. The climate, the abundant rainfall, the hot summers, do something to the plants here which I can only compare to magic. We started with basically bare yards (actually, it was worse than that. We had 6-foot weeds. No lie.) and now our yards are amazing (ok, I'm realizing I need to take some photos to show you. That will have to happen next week). Last summer, a neighbor offered us some raspberry starts. We stuck them up along a wooded fence and did nothing. 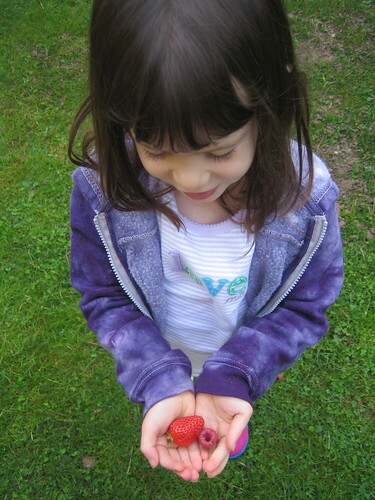 That summer we had a nice amount of berries, but nothing like what's happening this year! In another week or two we're going to have a bounty of berries! This year we've added strawberries. These aren't that plentiful this year, but I'm hoping by next we have more strawberries than we can eat (ok, that will never happen!). 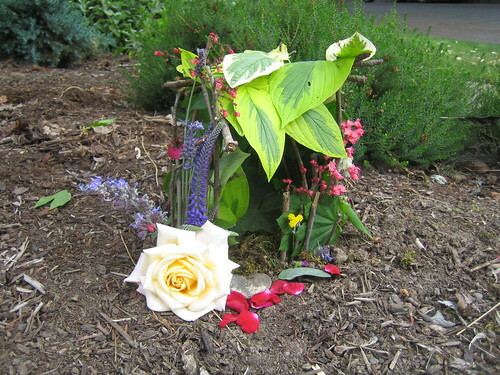 To add to the beauty, a little fairy house, built by Anna and her uber-talented babysitter, Robin. When Robin was younger, she built elaborate fairy houses all over her parent's yard, complete with shell furniture and berry offerings. Hidden away in tall grasses and under bushes, they add a perfect little touch of magic to the yard. 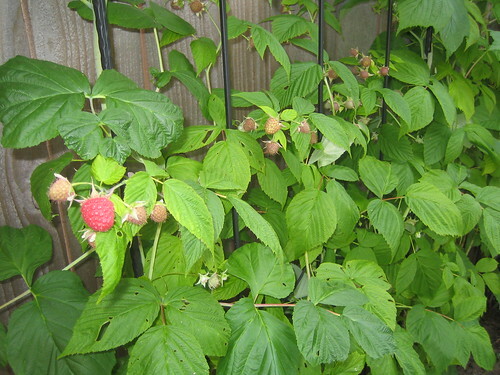 Your raspberry bushes are inspiring. I am hoping to plant blueberry and raspberry bushes this year -- so hopefully next year we can enjoy the fruits!